Some people left their heart in San Francisco as the song goes; in Vancouver, the city is the heart. 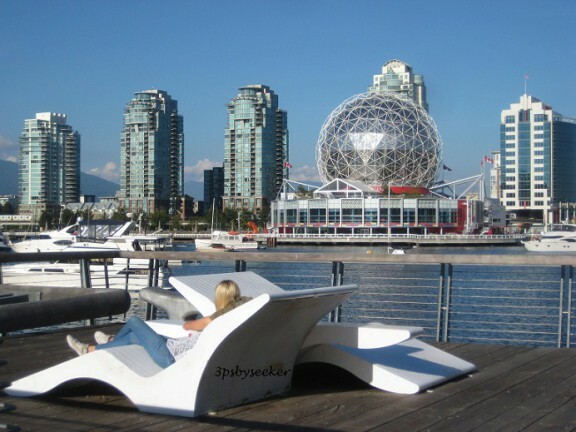 To see the beauty, from a distance, a lazy chair is available to sit, relax and admire the beauty of Science World and towering buildings. We have a beautiful seawall around False Creek and flotilla to take you from various destinations all the way to Granville Public Market, Maritime Museum or English Bay. Young people dream of working downtown where the action is. I was once one of them who moved to the city, close to the beach and aquatic center; I survived for a month and returned to the suburb for a more relaxed environment and still worked for 30 years being associated with big firms a boost to my ego and professional life. And then I grew up or should I say, grew tired working downtown and quit the city life. The song “Downtown” sang by Petula Clark still brings me to the city waiting for me to see the lights grow brighter, listen to the city traffic where I can forget my troubles and meet someone kind to help and understand you, someone who is just like you and needs a gentle hand to guide them along. 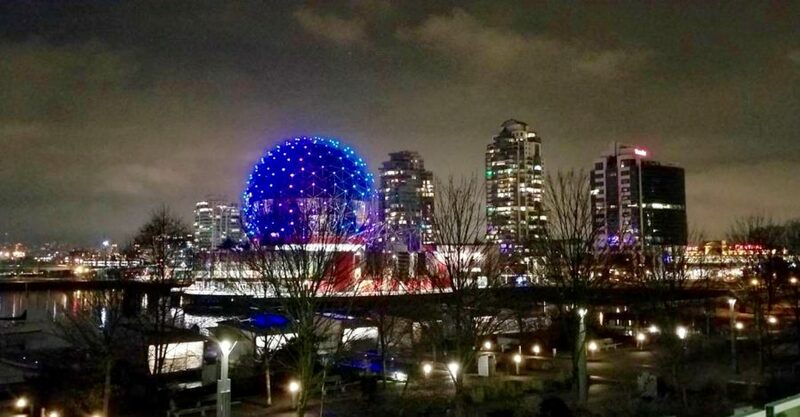 This entry was posted in Challenges, Life, Mental Health, Photography and tagged Canada, Challenges, Downtown, Lens-Artists, Meanwhile in Vancouver, Mental health, Phtography, Science World, Vancouver by Perpetua. Bookmark the permalink. Thank you, Amy, for your encouragements. You have delivered kind and encouraging messages through your posts. Can’t thank you enough for that. I suppose there is an advantage on living above shops especially if it’s a grocery store or drug mart. As for lights, that would keep you awake. One of our daughter’s lived in Vancouver for a bit before returning home to Ontario for school. She says it still remains in her heart. The city looks beautiful, day and night..
Vancouver is a lovely city. Hope you can come and visit us. Thank you. I’ve lived in the city for so long now that I think I’d probably go into cultural shock if I did move back to a small town. Suburbs or small is conducive to a serene lifestyle. Yup, traffic is crazy. Wonderful photos. You seem very proud of your city, although I understand your comments about working in the city. The same in London, lots of pressure! I’m just a proud Canadian and Canada is a land of opportunities. My niece lives in London and had visited her once. Talking about pressure! Oh, I hope I did not make you feel sad. Where are you now? Hopefully, you will return to Van soon.